Our bale spear has been with us for a few years now. It’s been through two states and two tractors but the basic format has always been the same. One absurdly large center spike and two little fellas on the bottom. Back in Missouri this was never a problem. 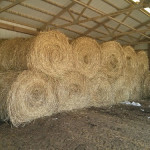 The dominant form of hay bales in Missouri is the large round bale. Stick the big spike in the middle of the circle and you’re good to go. 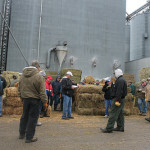 But here in Minnesota, round bales play second fiddle to the large square bale. Most of the diary farmers (the guys who put up really good hay) all use square balers. 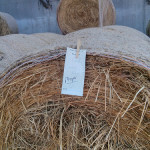 Thus, if you want to buy really good hay, you’re going to be looking at big square bales. This is where a giant center spike causes problems. Moving large square bales with our bale spear is problematic. Even with a very attentive operator there’s a decent possibility of breaking a bale and leaving 700-900# of loose hay lying around where you don’t want it. So after we got a bit more ‘lectricity in our shop, the bale spear was due for a reboot. 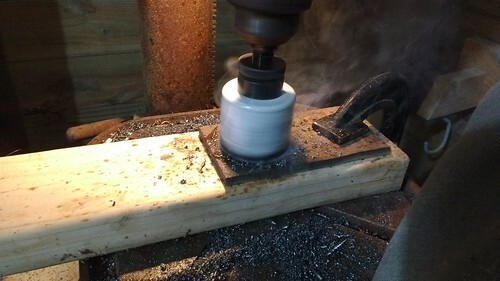 First order of business: Drill some big holes in a bunch of metal. Why drill holes you ask? 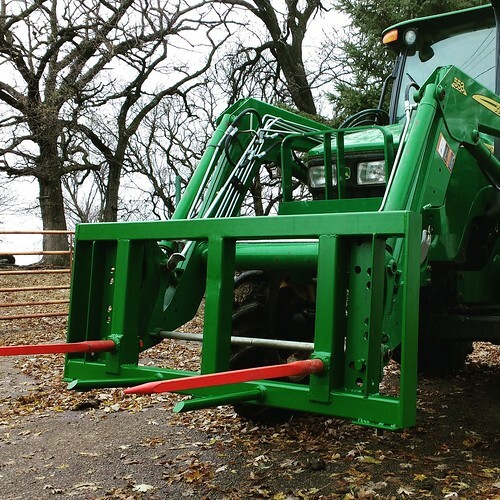 Because, dear reader, this big 2.125″ x 5″ steel cylinder is the key to the whole bale spike thing. Sure, it’s a cylinder on the outside, but inside it’s a bit more conical. So conical in fact, that it mates perfectly with the conical end of the bale spikes themselves. 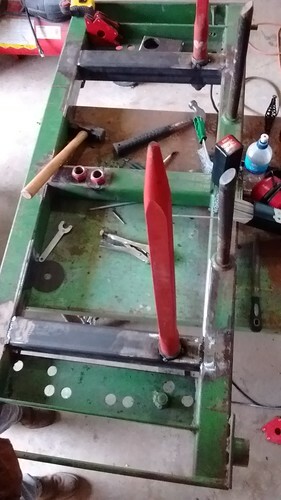 Of course there’s a giant nut on the end that keeps the spike from falling out, but it’s the cylinder that does most of the work. 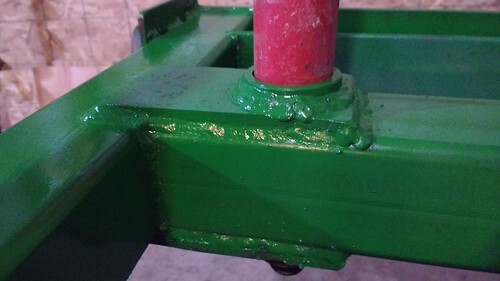 So several thousand pounds of force all channels down to a mere 5″ cylinder. That sounds like something worthy of a little attention. 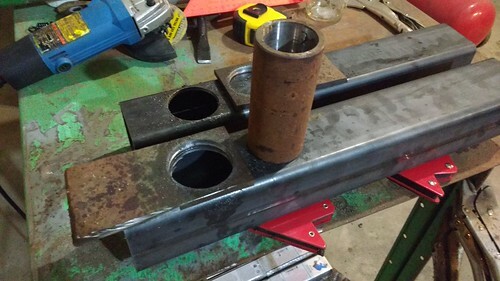 With all the holes drilled, we managed to get the cylinder nested in a chunk of 3″x3″ square tubing with a bit of 1/4″ plate on either side to give it a little more to hold on to. Before all the real welding fun can commence, the fitup must be checked a few dozen times and all the pieces have to be tacked into place. Then comes the welding. Lots of welding. 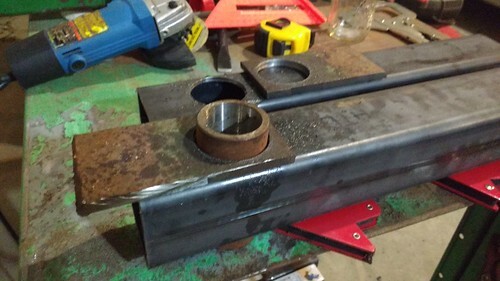 Many pounds of welding rod later and we’ve got something that looks like it should work. Of course there are no photos of welding, because that stuff’s bright. And I was a bit busy with the gloves, and welding helmet and all. Apparently I only slowed down when it was time to hit it with a few coats of John Deere green. And despite my best intentions, I did find myself singing about the star-crossed lovers Billy-Bob and Charlene. With the bale spear all completed I haven’t done much more than quickly pickup a large square bale of barley straw yet, but it appears to work. More importantly, it hasn’t fallen apart yet. As my first major welding project, I’m going to call it a success. And as with anything here on the farm, I couldn’t have done it without the interwebs. It is almost solely through watching hours and hours of Chucke2009 videos that I managed to become anything more than a dangerously incompetent welder. 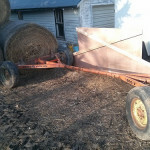 So now with the revamped bale spear we can buy better hay with confidence. Better hay means it ought to be easier to carry cattle over winter in better condition, which means better beef earlier in the spring. I like that you have two spears now instead of just one but it doesn’t look like the two have as much support as the one. How heavy are the square bales in comparison to the round bales? 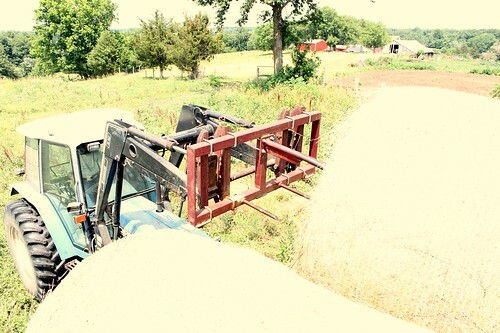 Big Squares only weigh 700-900# so they’re usually half the weight of a “Missouri size” big round bale. 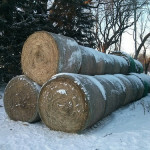 It’s really unusual to come across a 5′ diameter, 1800# round bale up here in Minnesota.